Overtaking all his opponents, with Japan’s dream resting on his shoulders! The F1 race driver with an impressive track record, Kamui Kobayashi, is becoming a Nendoroid! 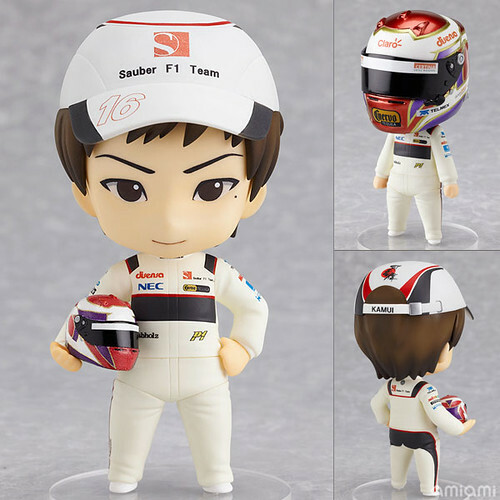 Even when shrunk down to Nendoroid size, the coloring and details on his helmet and racing suit have all been faithfully preserved based on their originals – even the sponsors names are included on his outfit. He also comes with extra parts that allow you to display him either holding his helmet, or wearing it – however you’d prefer to see him! This entry was posted in News and tagged formula 1, good smile racing, kobayashi kamui, nendoroid.